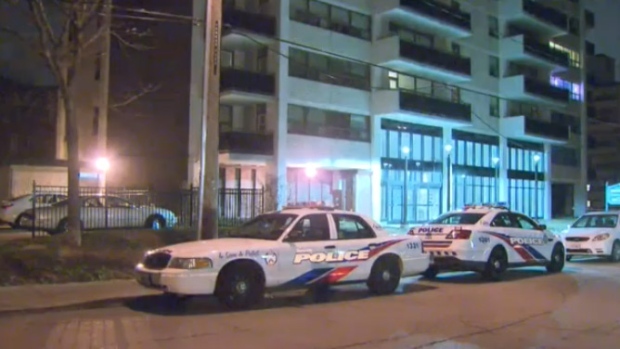 A fetus was found outside the Toronto apartment building where a soldier and his newlywed wife plummeted to their deaths earlier this week. Police said remains that appeared to be that of a human fetus were found close to a recycling bin on Wednesday morning, shortly after 9 a.m. The remains were found outside of 111 Raglan Ave., in the area of Bathurst Street and St. Clair Avenue West. Officers were also called to the building at approximately 6 p.m. on Sunday, when it was reported that a couple had fallen to their deaths from the building's 21st floor in what police are calling a murder-suicide. They were identified as Canadian Forces Sgt. Robert Giblin and his wife Precious Charbonneau. Investigators said they believe Charbonneau was pregnant at the time. She had been stabbed multiple times prior to falling to her death, officers said. Police have not said whether the incidents are connected. Police are asking anyone with information to contact them at 416-808-7400 or through Crime Stoppers anonymously at 416-222-8477 (TIPS).